I’ve so convinced myself that I do not like the Bloody Mary that I was shocked when I took a sip of the first one I ever made, and…really liked it. combine all ingredients in mixing glass, roll back and forth with a second mixing glass or metal half of Boston shaker until well mixed. Pour into ice-filled glass. Garnish with whatever strikes your fancy. I’ve long had a bit of a mental block about tomato juice in general. I love tomato soup. I love salsa. I’m even OK with the occasional gazpacho. But something about tomato juice has always turned me off. I don’t think I had ever tried a Bloody Mary before the Pacific Distillery dinner last summer, when one of the drinks was a Bloody Mary made with their Voyager gin. While it wasn’t my favorite drink of the night, I had to admit I found it pleasant. In preparing for BarSmarts, I decided I should tackle this drink. The standard recipe does call for vodka, but in a drink that should be savory, how could I not substitute gin? Some claim gin was the original liquor in the drink, others that using gin makes it a Ruddy Mary. Regardless, it’s a great choice. 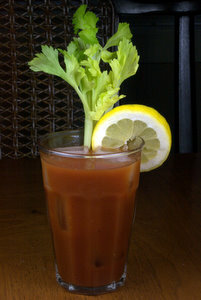 I also liked the idea of adding horseradish to the mix, as well as celery bitters. And apparently the choices worked well for me, because I’ve happily consumed this brunch staple beverage, and am seriously considering a second round, and what other flavors I’ll try. For certain, I want to see how wasabi works in place of the horseradish. I’m pretty excited to discover that this is a drink, so long a personal bugaboo, is something I can enjoy. Experimenting with spices and garnishes for this drink can be a lot of fun, and it’s an easy way to add more vegetables to my diet! What’s your favorite take on the Bloody Mary?